Miracle Osborne is a senior pursuing a double major in Accounting and Professional Spanish with a Minor in International Studies. 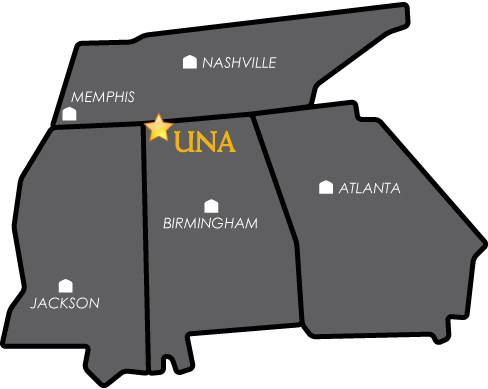 She graduated from Austin High School in Decatur, Alabama, and did not anticipate coming to UNA at first. Her sister is a UNA alumna so Miracle wanted to pursue a different route, like attending art school in Nashville. Several visits to the UNA campus later, she was wholly impressed. Miracle has been a member of the Student Government Association, Freshman Forum, Alpha Delta Ki sorority for which she currently serves as treasurer, La Grange Society, Hispanic Cultural Organization, and serves as a Navigator, a Senator, and in the Language Partner Program by working with ESL students. Miracle studied in Valencia, Spain, during the spring 2014 semester through the Magellan Exchange Program at the Polytechnic Institute of Valencia. “It was a really, really neat experience,” she said.